It’s time for students to register for a week at Encounters with Canada in Ottawa for next year! The theme calendar can be found at https://www.ewc-rdc.ca/pub/en/theme_week . Your quota (same as last year) is 1 student. ***Keep reading for exceptionally good news, though! Students must be between 14 and 17 years old when they participate. (You may be interested in the 2015 BC portrait that I’ve attached to this email regarding details about students who attend Encounters.) Please note that due to federal funding restrictions, students “age out” at 18 and cannot participate after they turn 18—so they must sign up for weeks that fall BEFORE their 18th birthday. Students must be Canadian citizens or Permanent Residents (Landed Immigrants). While they do not have to be your top students, students need to be able to afford to miss a week of school. They do NOT need to be bilingual to participate in Encounters; however, they should be aware that the program is offered in English and French, and students need to be respectful of the fact that they will hear French spoken there. It would be a perfect opportunity for students to make an effort to practice any French that they already know. Most important, of course, is that each student you select should be a good ambassador for your school and district. You must sign each of the student registration forms as the school representative (usually on p. 3, depending on how it prints out). Please check that the parent signature is in the section immediately above yours. If you plan to hold a meeting of interested students, you may wish to bring in students who have already attended to talk to your interested students and/or you could show them this video: https://www.ewc-rdc.ca/pub/en/begin_your_adventure . ** Students registering for one of the following three weeks will have a chance to win a $100.00 gift card at Ottawa’s largest shopping mall, Rideau Centre, AND for a limited time (now through June) will be eligible for a reduction in fees (as indicated below). Arts and Culture – August 28-September 3, 2016 – $600 (a $75 reduction from the regular $675 cost of the program if register by June) See attachment for additional info. Sports and Fitness – September 4-10, 2016 – $600 (a $75 reduction from the regular $675 cost of the program if register by June) See attachment for additional info. Sports and Fitness – September 11-17, 2016 – $600 (a $75 reduction from the regular $675 cost of the program if register by June) See attachment for additional info. Our Me To We student leadership team is asking for us to help them with this fundraiser. This is a great opportunity to coordinate fund raising in this area and make a difference for those impacted. The catastrophic effects of the fires in Alberta have impacted tens of thousands of people. The students in my Math 7 class have collectively come up with a district wide initiative to raise money to support the community. They would like to have “Toonie Tuesdays” for the next three Tuesdays in May. 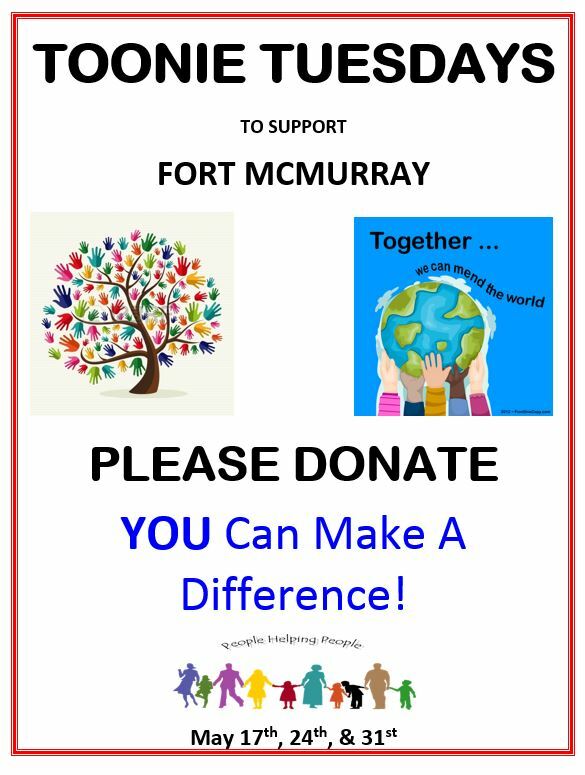 We are hoping this takes off as a district wide initiative in which every person, in every school, would bring in a Toonie to help the residents of Fort McMurray. The power of the Toonie can be astounding in conjunction with every other Toonie collected in the district. Lets work together to make this happen! Thank you on behalf of our Me to We Team! You’re invited to an open house to learn about Inquiry Hub, an award-winning secondary school in Coquitlam. Come and meet our current students and teachers. Check out our Maker Space and robotics. Experience some interactive, student-led sessions on a variety of topics. 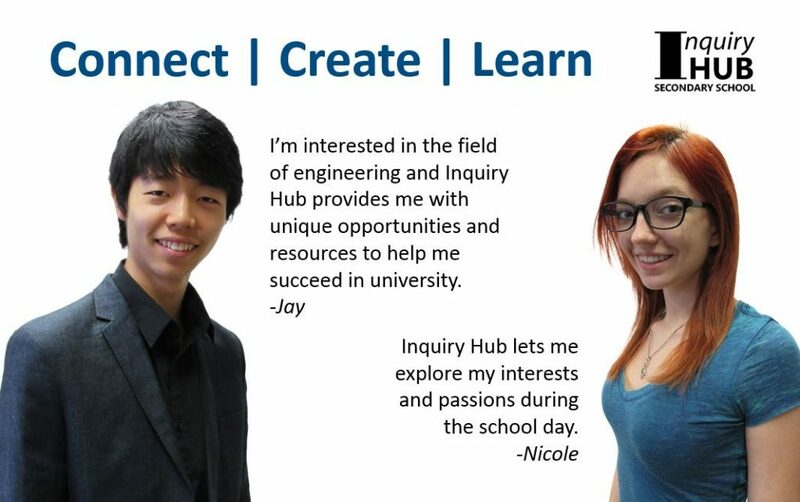 Inquiry Hub is a public high school of choice that provides students the opportunity to connect, create and learn in a technology-enabled, personalized, and blended learning environment. It has been recognized for its leadership in education, winning the 2015 Canadian Education Association’s Award for Innovation in Teaching and Learning. If you are a motivated learner who works independently and has a passion to learn about things that interest you, then come learn with us at Inquiry Hub! The Summer Child & Youth Pass is a pilot project, intended to increase access to participation. The pass is valid from June 21 – September 6, 2015. 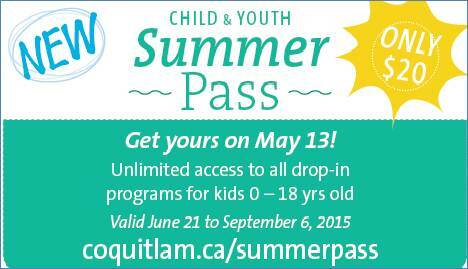 For only $20.00, a Summer Child & Youth Pass will provide unlimited access to all drop-in activities in Coquitlam. 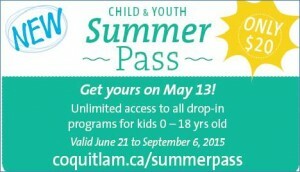 With this pass, children aged 0 – 18 years old will have unlimited access to all of our drop-in activities offered throughout the summer. This includes swimming at both indoor and outdoor pools, drop-in sports and outdoor drop-ins. Youth, 16 – 18 years old, will have access to all drop-in fitness classes and unlimited access to the City’s fitness centres. Before working out, teens MUST complete a one-hour Summer Teen Fitness Starter. A small registration cost of $2.00 is required. Register starting May 13! Award, Brochure, Food Safe and PAC Meeting. 2. Here is one of our two winning designs (according to students and teachers) of a Brochure created in Digital Literacy. This one is by Josh. Click here. 3. Many students will be taking Food Safe tomorrow (Friday Feb. 27th), paid for compliments of you… (our PAC). Please make sure students bring their Care Card Number/Health Care number! This is needed for them to get their Food Safe certification. A letter from Patricia Gartland, Superintendent of Schools, January 15, 2015. This is a program of choice, without a specific catchment area. Family interviews are conducted to determine an appropriate fit with the program. Safe Schools – Multi Family Letter Dec 2014 (2) – Although this was from December, all the information is relevant. Note the Tips for Parents on Gaming. Winter Moon Poster – Aboriginal Education is hosting the Winter Moon Community Dinner on January 20, 2015 at Banting Middle School. Parents as Career Coaches Workshop Poster for January 20 and 27, 2015 – Grade 10-12 parents in secondary schools to attend a Parents as Career Coaches workshop. Invitation to Lannie Kanevsky lecture – Learn more about the intensities that accompany giftedness. Below is the text of the letter from Tom Grant. 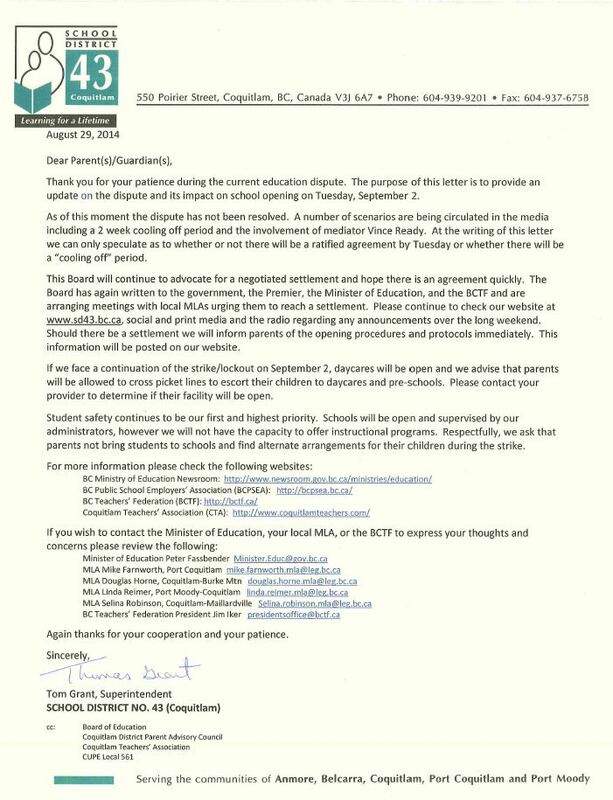 The letter can be viewed here: Letter to Parents re Teacher Strike Update Sept 8 2014. There has been a great deal of media coverage about the ongoing teachers’ strike and possible paths to a timely resolution. Many parents, students and staff who have followed the news may have questions regarding these recent developments and their impact on a return to our school year. This weekend the Minister of Education and his bargaining representatives declined binding arbitration at this time. We understand that the parties have suspended bargaining as they each seek to regroup and define further proposals for a resolution. Your School District No. 43 (Coquitlam) Board of Education and senior staff team understand that this is a difficult time for everyone. 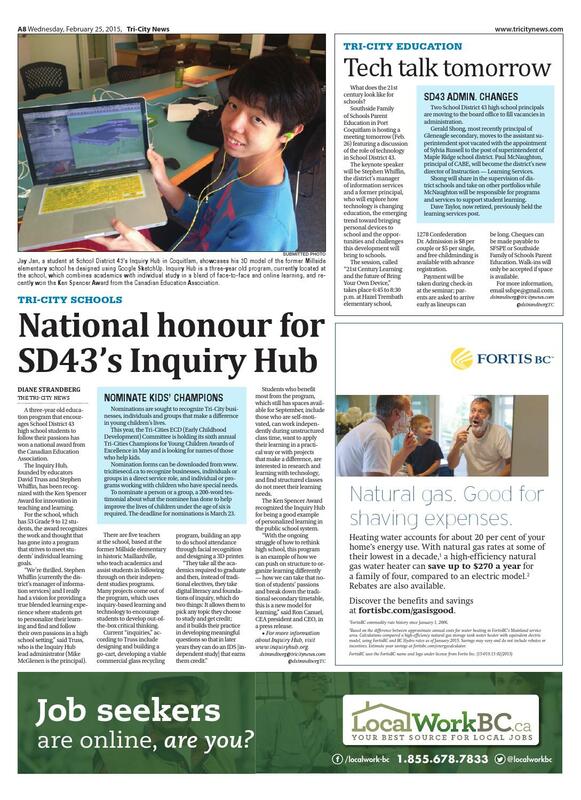 We remain committed to sharing timely and accurate information. Schools remain unable to offer educational programs at this time and until further notice. Again thanks for your cooperation and your patience. An email from me, Dave Truss, will come later this week.